Dhanurasana is also known as 'Bow Pose'. Because this pose looks like archer's bow. Dhanurasana is the combination of 2 Sanskrit words, 'Dhanura' + 'Asana'. Where, Dhanura means 'Bow', and Pose means 'Asana'. Dhanurasana is the back bending Yoga pose, which is also called as 'Urdva Chakrasana'. How to do Bow pose? Lie down on your stomach on Yoga Mat with feet hip-width apart and place your arms at the side of your body. Take couple of deep breath and calm your mind. While breath - in, bend your knees and hold your ankles with your hands. While breath - out, lift off your chest and pull the legs up. Then slowly bring your chest and legs back to ground or yoga mat. Now release the hold on ankles and bring hands back to the side of your body and relax for few seconds. Make sure only your Navel part of the body touches to the floor or yoga mat. Do not try to hold this yoga pose beyond your capacity. Do not hold your breath. Keep breathing while doing this pose. Let your body move or seesaw at step 3 because of breathing. Good massage for Gastric organs. Dhanurasana yoga pose strengthen legs, buttocks, spine, back muscles, shoulders and neck etc. Dhanurasana helps to reduce excess fat around the belly, waist and hips. This yoga pose helps to stimulate reproductive organs. 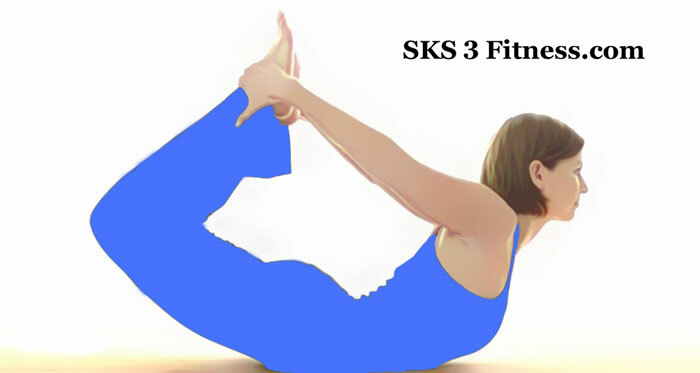 This yoga pose helps people with renal (kidney) disorders. Dhanurasana improves blood circulation in body.This Yoga pose is effective in weight loss. This Yoga pose improves digestion and appetite. This Yoga pose helps to cure dyspepsia, rheumatism and gastrointestinal problems. This Yoga pose tones the legs and arms muscles. Dhanurasana improve the function of liver, pancreas, small intestine and big intestine. This Yoga pose cures constipation. This Yoga pose gives great flexibility to the back. This Yoga pose cures menstruation disorder. Dhanurasana improve function of kidney and liver. This Yoga pose improves overall body posture. This Yoga pose cures respiratory disorder like asthama. This Yoga pose is beneficial in diabetes. Dhanurasana helpful in stimulating reproductive organs. Those who have back pain or neck pain should avoid doing Dhanurasana or Bow pose. Those who have high blood pressure, hernia, peptic ulcer and any cardiac problems should avoid doing this Yoga pose.